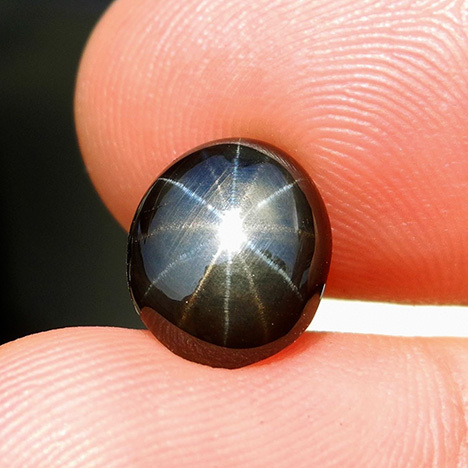 A 12-rayed black star sapphire, weighing 3.6 ct, with one set of golden rays and another set of silver rays producing two different-colored stars. Photo by Simon Bruce-Lockhart. The Thai city of Chanthaburi is a well-known international trading hub for colored gemstones but was once an important corundum mining center. In recent decades, mining activity in the area has decreased, but there are still several smaller-scale operations active. The 3.6 ct 12-rayed black star sapphire shown above was mined in 2017 in Bang Kha Cha (or Bang Kaja), a mining locality near Chanthaburi. Thailand’s gemstone deposits typically produce blue, green, and yellow sapphires (and combinations of these colors). The deposits in eastern Thailand also produce a peculiar sapphire variety: black star sapphire. This variety is found in other basalt-related deposits like Australia, but they rarely match the size, quality, and abundance that the Thai stones are famous for. The black color is due to a very high concentration of Fe-rich particles, identified as hematite and ilmenite. This high density of particles completely masks the bodycolor of the stone. When strongly illuminated from the back, glimpses of the bluish green bodycolor in this gem can be seen. If the platy, Fe-rich particles are oriented in the correct way, they result in a six-rayed star pattern. This star is often yellowish golden in color. Another common inclusion in corundum is rutile needles. When they are abundant and correctly oriented in the crystal, this might also result in a six-rayed pattern, often with a whitish silvery color. In some cases, both of these patterns overlap, creating a 12-rayed star with one set of golden-yellow rays and one set of silver-white rays. The stone in this entry is an excellent example of this phenomenon, displaying well-centered, sharp asterism with two different-colored stars. Wim Vertriest is supervisor of field gemology at GIA in Bangkok. Simon Bruce-Lockhart is an independent gemologist in Chanthaburi, Thailand.